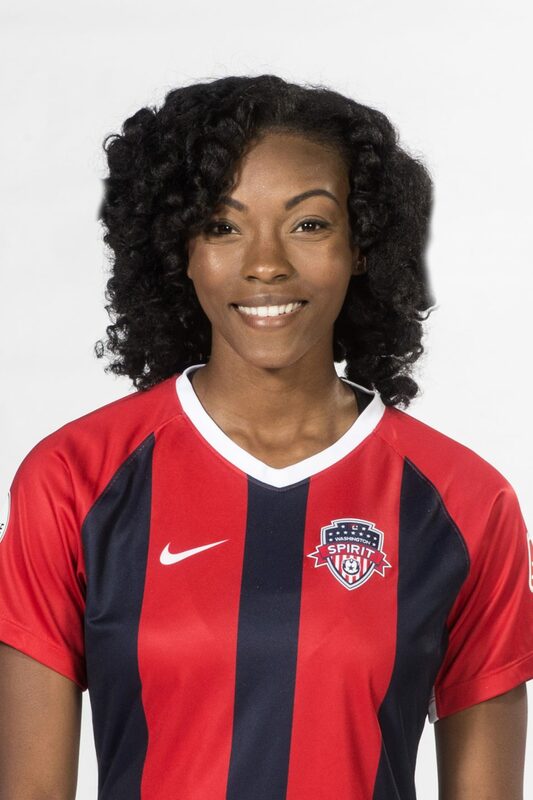 The Spirit drafted Cheyna Matthews (formerly Cheyna Williams) with the 7th overall pick in the 2016 NWSL College Draft. 2018: Matthews missed the 2018 NWSL season due to pregnancy/maternity. 2017: Scored five goals over the course of 21 games, including 16 starts for the Spirit in her second NWSL season. 2016: Drafted by the Spirit with the 7th overall pick in the 2016 NWSL College Draft…played in 17 regular season games, 8 starts, totaling 779 minutes…scored three goals. Matthews started every game for the Seminoles in 2015 as they reached their fifth consecutive College Cup. She led the team with 10 goals on the season. In 2014, Cheyna played in all 26 games and made 24 starts helping Florida State win its first NCAA National Championship in program history.2015: Led the team with 10 goals on the season – ninth-best in the ACC – and finished second overall with 27 points as she added seven assists on the year. 2014: Transferred to Florida State University from Vanderbilt…Played in all 26 games and made 24 starts in her first season at Florida State in helping the Seminoles win their first NCAA National Championship in program history…Named the 2014 College Cup Most Outstanding Player on Offense with two goals in the national semifinal game against No. 3 Stanford and an assist in the national championship game against No. 4 Virginia…Tallied 14 goals on the season, good for second-most of the team and tied for fourth in the ACC… 2013: Named First Team All-SEC … Played in 1,432 minutes as the teams top offensive player … Finished 2013 with 37 points on 16 goals and five assists … Recorded four multi-goal games and scored six or more points in three games … Finished 2013 tied for second on the single-season scoring list, and fifth on the single-season points list. 2012: Played in 17 games as a freshman forward, making 15 starts… Led the Commodores in scoring with six goals and six assists for a total of 18 points… Named to NSCAA All-South Region third team… Also recognized on the SEC All-Freshman Team.